Ed Thompson has always seemed to live in his brother, former Wisconsin Governor, Tommy Thompson’s long shadow, much like Billy Carter or Roger Clinton. 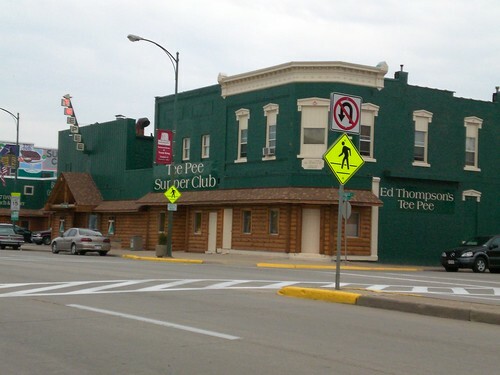 In the 1990s Ed was thrust into the statewide news when his Tee Pee Supper Club, located in Downtown Tomah, Wisconsin, was raided and Ed was charged for having illegal gambling machines. Almost every bar in small to mid-size Cities across the state has these gambling machines in them. The signs state they are for entertainment purposes only but those in the know understand that most bars will payout for winnings, especially if you are a regular. Bar owners justify these machines by saying that the Indian Casinos have an unfair advantage and are drawing people away from their bars. While I disagree with their premise that somehow they are losing business because of Indian Gaming, I don’t really have a problem with bars having these machines. Actually I think the state should allow every bar to have a maximum of 10 gaming machines. The state would collect taxes on the winnings and the tavern owners would quit whining. However, if the state would allow this, the tavern owners should have to drop their support of the horrible liquor license quota system, which is causing headaches for growing Cities across the state. Ed Thompson also ran as the Libertarian Candidate in the 2002 race for Wisconsin’s governor and garnered a respectable 11 percent of the vote. I would argue that he would have made a better governor than either McCallum or Doyle. In 2005, despite the fact that he was not running, Ed won a seat on the Tomah Common Council with 90 percent of the vote. His “opponent” in the race received 1 vote, which was cast by Ed Thompson (at least according to Wikipedia)I was in Tomah for a couple of days and I knew I had to check out Ed’s landmark Tee Pee Restaurant. Located in downtown Tomah on Superior Avenue, which was also the inspiration for the comic strip, Gasoline Alley, Ed Thompson’s Tee Pee really stands out. It is a large green building with gigantic signs that you cannot miss. I went on a Sunday evening and I was surprised at how many people were either huddled at the bar or enjoying dinner in the dining room. It truly is the place to be in Tomah. This atmosphere of this place screams out “you must order an Old Fashioned! !” and though I almost never order hard liquor with the exception of gin and tonic, I was tempted to order one. They claim that they are famous for them but I kind of had a taste for beer so I settled in and ordered a New Glarus Spotted Cow. When I was a kid my favorite supper club menu item hands down was deep fried Walleye Pike, though I would sometimes try roasted duck, scallops or seafood platters, and ribeye steak. The Tee Pee Supper Club didn’t have duck or Walleye Pike but they did have a seafood platter that looked impressive as it was brought to a nearby table. It featured scallops, shrimp and whitefish which you can either have battered and fried or broiled. I imagine either method would have resulted in a nice dinner. But I was in the mood for steak so I settled on a ribeye. At the Tee Pee, as with most supper clubs, you get your choice of potato which included a baked potato, American fries, French fries, Au Gratin potatoes, or wild rice blend. I was tempted to try the wild rice blend but opted for the traditional potato of choice, the baked with sour cream. I was then directed to the all-you-can eat salad and soup bar. I had read somewhere that their potato cheese soup was not to be missed and thankfully it was featured on the night I was there. The cream-based soup was the perfect consistency. Too often potato soups are starchy and almost the consistency of oatmeal making them quite filling. The soup was a bit lighter and was filled with chunks of bacon and potatoes. It definitely lived up to the hype. Ed Thompson’s has a serve-yourself soup and salad bar so I tried the other offering, Turkey and Rice. It was very pedestrian. A step above canned but still very boring. The salad bar is quite simple, iceberg lettuce, various toppings and the typical dressings like Ranch, Creamy Bleu Cheese, French and Italian. The bleu cheese dressing was very thick, almost the consistency of sour cream. The salad bar wasn’t bad, but it wasn’t anything special either, though the real bits of bacon were a nice touch. Most places use those crappy artificial bacon bits. My waitress brought out a small warm loaf of bread and there was a dish filled with butter packets sitting on the table. I ate a couple of buttered slices and the bread was very good, but I needed to save room for the steak and potato, which were brought out as I finished my soup and salad. The steak was served on one of those plates with the metal insert which helps keep the steak warm. The outside was nicely charred and the kitchen had managed to cook it to the exact level of doneness I requested, medium rare. I bit in and was taken back to those days as a kid eating juicy ribeye steaks at places like the Indian Lodge in St. Germain or the Plantation, just north of Minocqua. It was not the best steak I had ever had (that distinction goes to Charlie Palmer’s Aureole in Las Vegas) but for the price (around 16 bucks, I believe) it was very good. Considering that most steak houses are getting upwards of 50 bucks a steak, eating at the Tee Pee is a real bargain. Over the years Wisconsin supper clubs have been disappearing from the landscape as people seek healthier more contemporary and more convenient dining choices. Luckily there are still some excellent Supper Clubs that show no signs of giving way to this trend. Ed Thompson’s Tee Pee Supper Club is definitely one of those places. You won’t find any groundbreaking cuisine here, just a wide array of supper club staples that keeps locals and visitors to Tomah very satisfied.